Well, it’s not the cover of the “Rolling Stone”, but I was quoted (so to speak) on the front page of USAToday. The topic was supposed to be about “Raw Milk Benefits.” Sadly, the reporter condensed our hour long conversation into two lines and missed the main point I made, which was “know your source.” You need to know your source because raw milk collected properly from cows that have been fed good feed is a much different product than confinement dairy milk. 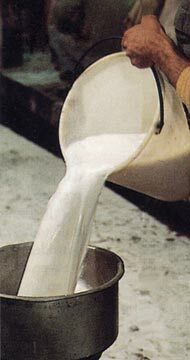 Raw milk from a confinement dairy is not handled the same way a certified raw dairy would handle the milk. They are expecting to be able to pasteurize the milk before shipping it. I would not drink it because confinement dairy cows are fed poorly, which results in acidosis, E.Coli 157 problems and other issues. If I had a dollar for every time I have seen a frown when I mentioned drinking fresh milk to one of my friends, I would be wealthy. Rarely have they ever tried it. Most have assimilated a profound prejudice against it because of what they were taught in school about the “benefits of pasteurization”. That idea, compounded by the daily germophobic assaults from products like Lysol, have them living in terror that they may somehow come in contact with deadly pathogens. In fact, if your body ever killed off all the microscopic creatures that you have a symbiotic relationship with, you would die. From time to time, we need our food to replenish those bacteria. This lesson was brought home to me in a startling fashion when my grandson’s digestive system failed to work properly shortly after his birth. The allopathic doctor said “give him antibiotics” (That must be a mantra of theirs.) Nothing changed. After 20 minutes with a dictionary I found all those critters in a form we could put in his bottled breast milk. Within two days his stools were normal and I was on a new path of discovery. Through the work of the Weston A. Price foundation, I discovered that properly collected fresh milk from properly maintained cows was better for me per Dr. Mercola and less likely to make me sick than pasteurized milk. The fact that it was NOT homogenized was an added health bonus. I joined the Weston A. Price Foundation over 10 years ago because I appreciate the unvarnished truth they present about nutrient dense foods. The cornerstone food I first discovered there was raw milk. They have a whole website dedicated just to that subject at www.realmilk.com. Collect the milk in a sanitary fashion and chill it to below 40 degrees (F) within 2 hours. Feed the animals providing the milk a diet that promotes their health. Do not mix batches of milk to promote the longest shelf life. Allow the milk to offer its best moment. Cream, buttermilk or cheese occur at different stages. What they never told you was this was a poor option chosen for profit instead of a better option: clean raw milk from healthy, properly maintained cows. This option also favored the large, collective dairy over the smaller, local farmer. Again, corporate profit was the deciding factor in selecting this model. For detailed discussions on how the milk industry evolved into what it is today see Dr. Ron Schmidt’s”The Untold Story of Milk” and Dr. William C. Douglass, II, “The Milk Book”. Recently the USDA has allowed the major dairy interests to eviscerate the “Organic” standards so that their cows need no longer even see a blade grass. Fortunately, our friends at Organic Pastures Dairy in CA have established real Raw Milk standards that will ensure a healthy product from healthy cows. And they have organized consumers to persuade the politicians to help in the fight against the dairy conglomerates. If you would like to see the measures that organic raw milk dairies pursue to make sure their milk is as safe and nutritious as it could be, read their detailed report. There has been such a long, systemic bias against raw milk by the large dairy interests and politically compromised groups such as the CDC, that finding unbiased research is difficult. However, we recently found a study on Amish children that showed that children who regularly drink raw milk have better immune systems and a lower rate of Asthma.